Tiramisu is a traditional Italian dessert, which literally means pick me up (tirami-su). This dessert has many variations, but the constant ingredient, in all the variations is Mascarpone cheese. The basic ingredients of Tiramisu include, eggs, mascarpone cheese, ladyfingers, cream, espresso coffee, liquors like brandy, marsala and rum, a little bit of sugar, and cocoa or shaved chocolate. Since the basic recipe uses raw eggs, I have made some modifications. The recipe is adapted from here and here. Chocolate Cream filling: Heat the cream, remove from heat and add the chocolate. Let the chocolate melt and let the mixture cool. Whisk together the mascarpone and cream cheese in a mixing bowl until smooth. Add the chocolate mixture and mix well. Keep in refrigerator till further use. Coffee Soaking Syrup: In a large shallow bowl combine the coffee and sugar. Taste and add more sugar if you like. Set aside. To Assemble:Have ready the ladyfingers, coffee mixture, and cream filling. Taking half of the lady finger biscuits, dip each one into the coffee mixture and place the lady fingers in an even layer at the bottom of a rectangular loaf pan or a dish. Spread half of the cream filling on the lady fingers, then add half of the raspberries over the cream. Repeat with another layer of ladyfingers, over this spread the remaining cream filling. Cover the Tiramisu with plastic wrap and refrigerate at least 6 hours, preferably overnight. To Serve: Remove the plastic wrap. 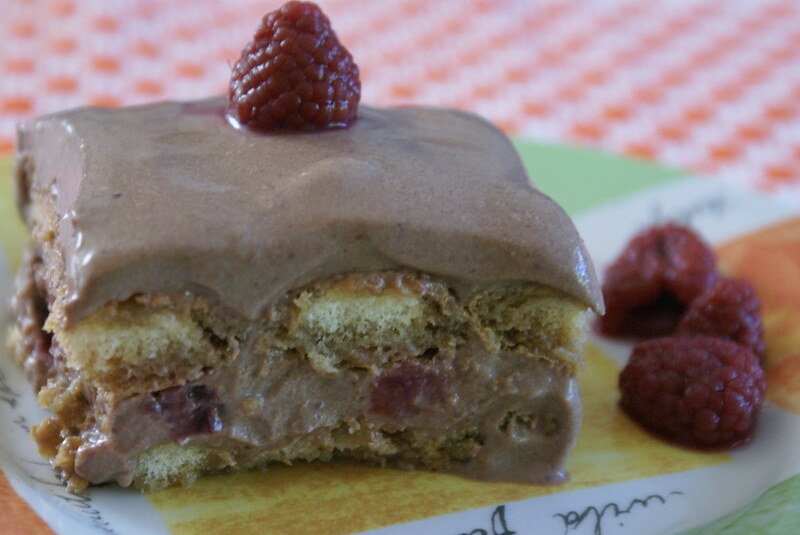 Sift cocoa powder over the top of the Tiramisu and decorate with raspberries. We enjoyed each and every bit to the last!!! The theme for the SHF, this month is Regional or Local dish, and as it is also mentioned that the local dish from the recent vacation is also accepted, this is my entry (inspired by the Italy trip last month) for the Sugar High Fridays event being hosted by Johanna of The Passionate Cook. That does look great. Love the way the top layer looks so moist! Valli and Coffee, Thank You! Viji, ya it was worth tryinh! Meeta, thanks, actually I was not able to resist and wait till the dessert was set properly, and cut myself a large piece, just after 1 hr in the fridge, that is the reason of it being so moist 🙂 and in the hurry I even forgot to sprinkle with cocao pwd!! oh my god! u have made me crave for something sweet now. this looks so yummy! the first and last time i tried tiramisu was at an office party in a restaurant called ‘little italy’ in hyderabad. didnt know the recipe was quite simple.. will definitely try it out as soon as i get hold of all the recipes.. I can show up from anywhere to eat Tiramisu! Eggless is very comforting. Liked your version. I Love Tiramisu too! Yours looks great. I tried a recipe a while ago that didn’t require any eggs. Will post it the next time I make it. that sure looks like a small piece of heaven. yummy and great . Pass me a slice, please. N, how did u like taste? I heard Little Italy is quite a good place to eat! Seec, ya, even I was not comfortable with using raw eggs! Asha, I guess u will find it in the cheese section!! DO try it, its worth it! Laavanya, waiting for ur version! I love tiramisu. Check out my version with dates! Good job girl… it looks really yummy and moist… and what an apt quote, a piece of heaven indeed! one of my favourites. thanks for this recipe. 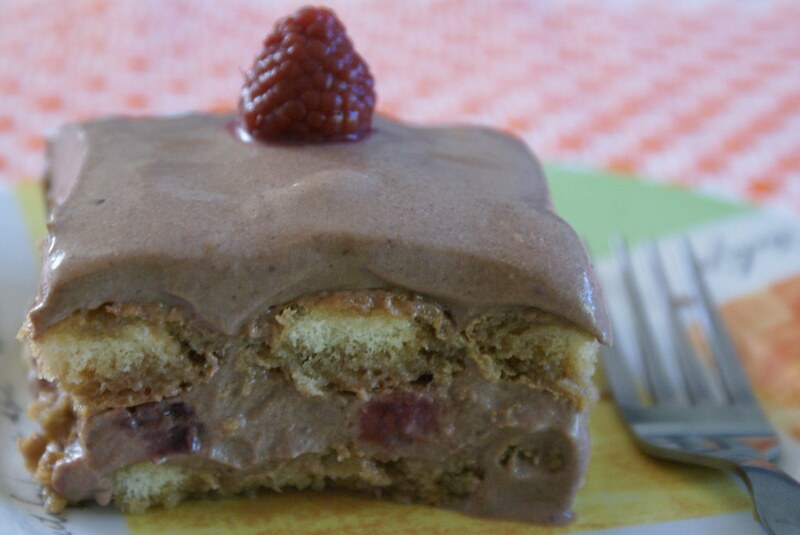 The tiramasu looks delightful! I am not too much a desert person… but i do enjoy a good tiramasu, the bets one i’ve had so far is from Cheesecake factory! Its heavenly! wowwwwwwwww lovely tiramisu….Very good picture.Realy bookmarking.i always wanted to know the recipe of tiramisu,thanks for sharing. looks yummy and delicious. Great pics. Thanks for sharing. This dessert looks yummy.thanks for the recipe. Lovely dessert. Very tempting cinnamon. Beautiful pics. Thanks for sharing. Oh my goodness, that is looking so mouth watering. Great entry. Bee, it was my pleasure sharing !! Latha, Tiramisu is liked by every one since it is not very sweet, and at the same time taste yummm..
Richa, Jyothi, TBC, Thank You ! I wish I was there NOW. Where in Hyd do you get Ladyfinger biscuits and raspberries??? Ladyfinger maybe in Q-Mart in Banjara Hills, but raspberries?? mmmh! Tiramisu! one of my favourite desserts of all times, but only if done well! i have had many a horrible tiramisu in a restaurant, but your version looks fantastic! thanks so much for your contribution! Cinnamon…this is really tempting! Looks Delish! Can I have some please???? It really looks very yummy. I was planning to try making over a weekend but unable to get certain ingredients like lady fingure biscuits & mascarpone cheese.It would be a great help if you can direct on the best source to get them. Thanks for the help. Once again looks too good, looking fw making it. you are lucky to find mascarpone in Hyderabad. I have no luck so far in Chennai and u r right you need mascarpone in it. I love brandy in tirimisu.